The KOEL team heads north for our summer issue. We bring you a fusion of Scandinavian and Asian influences as we reminisce about our time in Singapore, while celebrating the Nordic summer in our new studio. 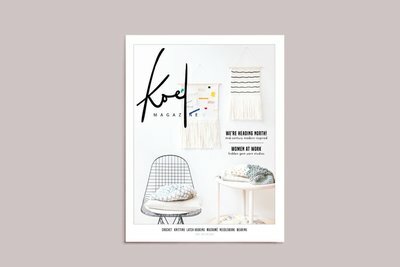 In Issue 3, we pay tribute to the beauty of Danish furniture and its perfect fit with yarn crafting, go monochrome in our designs and collaborate with some of the most talented fiber artists worldwide, such as Alise Anderson, Veselka Bukan and Mrs. Novo. Expect a global tour of our favorite yarn crafters’ studios and many more exciting new stories for you to discover.